The green bacteria Prosthecochloris aestuarii cells and cell fragments were embedded in isotropic and stretched poly vinyl alcohol films. The samples with great amount of oligomeric bacteriochlorophyll c as well as with desaggregated oligomers were investigated. 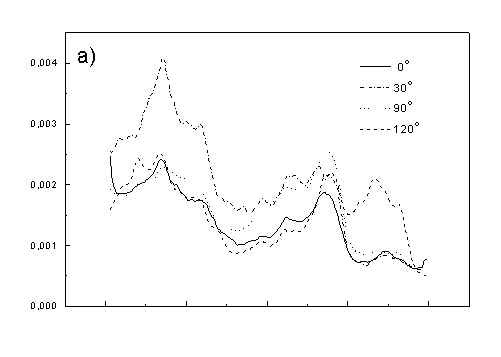 The photoacoustic spectra were measured at the directions of electric vector of actinic light changed at every 30 deg from 0 deg till 180 deg with respect to some direction in a film plane. The average mutual angle between transition moments of monomeric and oligomeric bacteriochlorophyll c was established from the dependence of photoacoustic signal amplitude on the direction of light polarization. Also the angles between average direction of carotenoid transition moments and transition moments of bacteriochlorophylls were evaluated. The angle between monomeric bacteriochlorophyll c in a samples without oligomers was about 30 deg, whereas in a sample containing oligomers about 60 deg. Film stretching as well as cell fragmentation change the pigment transition moments directions, therefore predominantly the unstretched samples with whole green bacteria cells were investigated. The polarized absorption and fluorescence spectra were also measured. Main role of antenna pigments in photosynthetic apparatus is the excitation energy transfer to reaction center, but part of excitation energy could be emitted as luminescence or converted into heat [1,2]. Giant antenna complexes of green bacteria are named chlorosomes. Their main pigment is bacteriochlorophyll (BChl) c in oligomeric state [1,2]. This pigment can be desaggregated but usually still is located in chlorosomes  and preserve some orientation with respect to chlorosome long axis [4,5]. The cells of green bacteria Prosthecochloris aestuarii and their fragments can be embedded in poly vinyl alcohol (PVA) film, but the cell fragmentation and film stretching causes usually desaggregation of BChl c [4,5]. 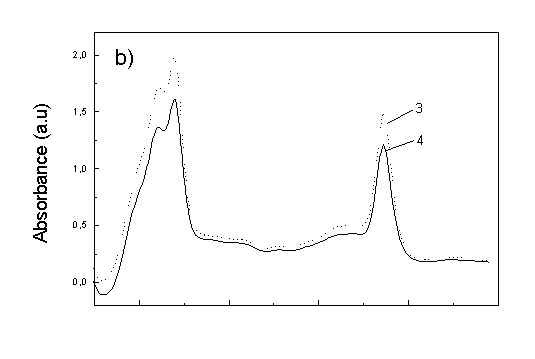 Also in unstretched film is possible to obtained BChl c in mainly monomeric and small aggregate states similar to observed in liquid crystal matrix [4,5,6]. We want to compare the yield of thermal deactivation of oligomeric and desaggregated pigment in organisms embedded in the same rigid matrix. Previously  we have shown for cyanobacteria samples that from the measurements of photoacoustic (PAS) spectra for various polarization of light it is possible to evaluate mutual directions of pigment transition moments (TMs). The dependence of the PAS signal amplitudes on various angles of light polarization at given spectral region enable to drown information about the directions of TMs of thermally deactivating molecules. Now we apply this method in a case of green bacteria Prosthecochloris aestuarii cells and cell fragments embedded in PVA films. Two types of cells were investigated: with BChl c in chlorosome in oligomeric state and with this pigment desaggregated in high degree. The culture of Prosthecochloris aestuarii 2K strain, purification of BChl c, introduction of the sample into polymer film, and film stretching procedure were described previously [5,6,8]. 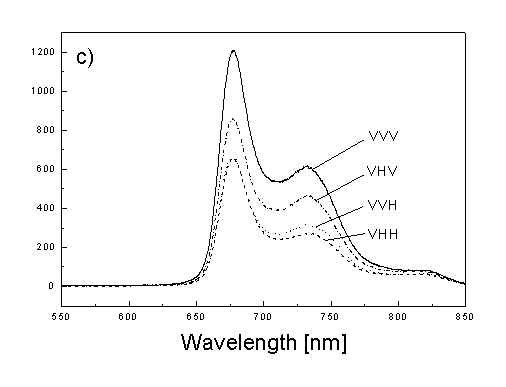 The absorption spectra were collected using Shimadzu UV-V1601 spectrophotometer whilst the fluorescence spectra were obtained with Hitachi F4500. Both arrangements were equipped with polarizers. 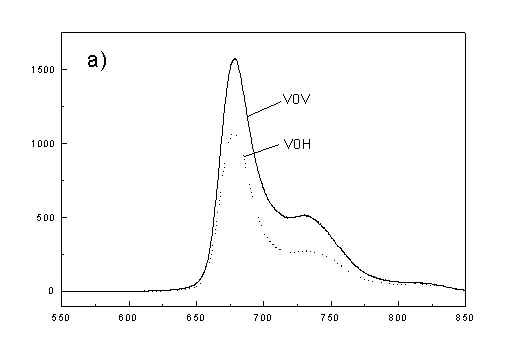 For stretched samples four following polarized components of fluorescence were measured: VVV, VVH, VHV and VHH (V-vertical, H-horizontal). The first and last letters refer to the direction of the electric vector of excitation and emission light, respectively, and the middle to the orientation of the axis of the PVA film. In a case of unstretched samples two components (V0V and V0H) were measured (middle 0 means unstretched film). The PAS spectra were collected using one beam photoacoustic spectrometer  with MTEC Model 300 photoacoustic cell equipped with spherical light reflecting mirror. Both measurements for sample and carbon black reference were taken at the same polarizer position, therefore the absorption of polarizer was compensated. For stretched samples the electric vector of acting light was aligned first along stretching axis and then rotated at 30 deg till 180 deg. For unstretched sample initial polarizer position was arbitrary, but changes were done similarly for every 30 deg from this 0 deg position till 180 deg. From such set of PAS spectra the dependence of PAS signal amplitude on the angle q between axis in film plane and the direction of electric vector of light were obtained. From these dependences the mutual angles between various pigment TMs were obtained. 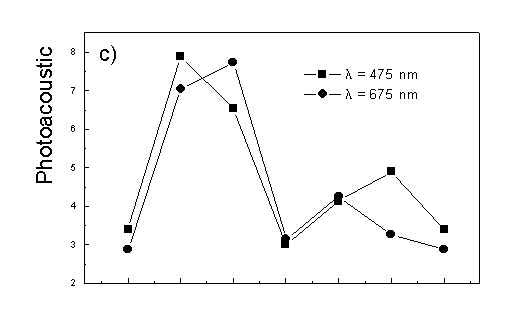 Figure 1a shows the absorption spectra of two types of whole bacteria cells in isotropic film. 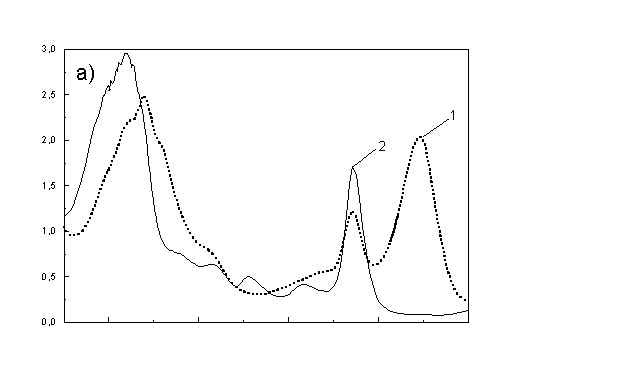 As it follows from the ratio of absorption in 750 nm (oligomeric absorption) to absorption at 670 nm (monomeric BChl c, bacteriopheophythin c and eventually small aggregates of BChl c ) the degree of oligomerization in these two samples are different. As it was shown previously [4,5] the BChl c after desaggregation is in some extent oriented. The same conclusion follows from Fig. 1b showing the polarized absorption of whole bacteria with desaggregated oligomers located in stretched film. The cell fragmentation usually caused desaggregation of BChl c [4,5], but also in this case the pigment is in some degree ordered in stretched film (Fig. 1c). Fig. 1. 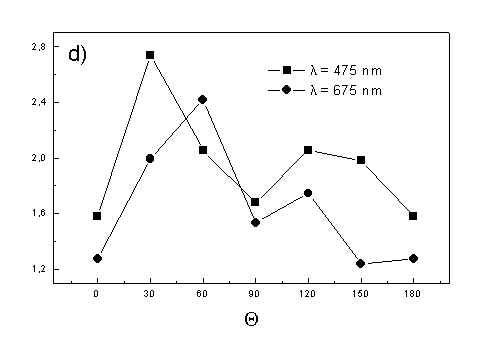 Absorption spectra: (a) whole cells: curve 1 - sample with oligomers; curve 2 - with desaggregated oligomers; (b) polarized absorption spectra of whole cells without oligomers and (c) polarized absorption of cell fragments in stretched film, curve 3 – parallel and curve 4 – perpendicular polarized components. 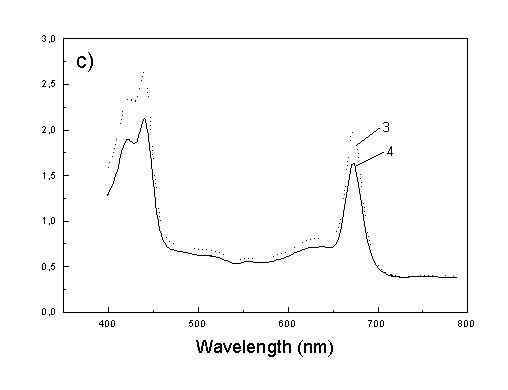 Figures 2a, 2b, 2c show the set of polarized fluorescence spectra for a sample with low content of the oligomers. It is interesting that in stretched samples with whole bacteria and bacteria fragments the ratio of emission belonging to small aggregates (at 730 nm) to that of monomeric (at 670 nm) is higher than in unstretched films. It follows from absorption that stretching causes decrease in oligomerization. The desaggregation can undergoes on small aggregates rather than on monomers. It is also possible that TMs of small aggregates are located in stretched samples closer to film plane than in unstretched film and therefore they give larger contribution to emission spectra. In unstretched samples the degree of anisotropy of emission due to photoselection is lower than in stretched samples because (V0V-V0H)/(V0V+2V0H) < (VVV-VVH)/(VVV+2VVH). 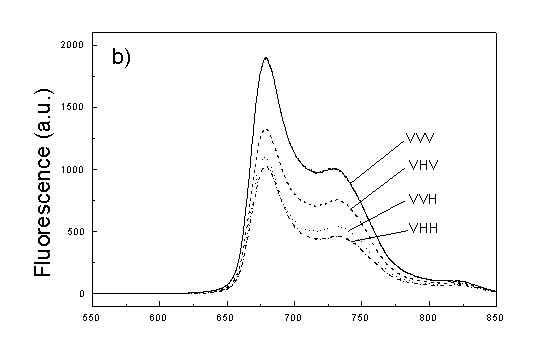 It is very characteristic that in both stretched samples components VVH are very similar to VHH and low. It means that chromophores emitting fluorescence polarized perpendicularly to polarized excitation are in low extent oriented and not very numerous. 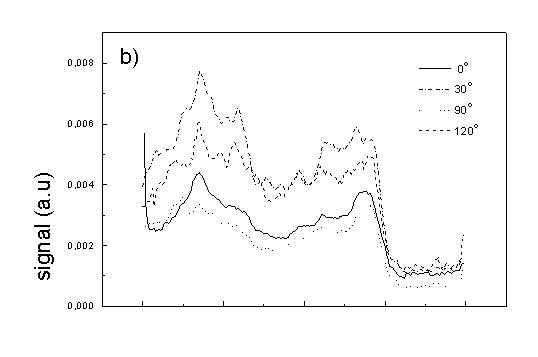 Emission of oligomers in cells embedded in PVA film is always low [4,5] therefore polarized emission of such samples are not very well reproducible (not shown). fig. 2. Polarized fluorescence spectra: (a) whole cells without oligomers in unstretched film; (b) the same sample in stretched film; (c) cell fragments in stretched film (notation of polarized components - in text). 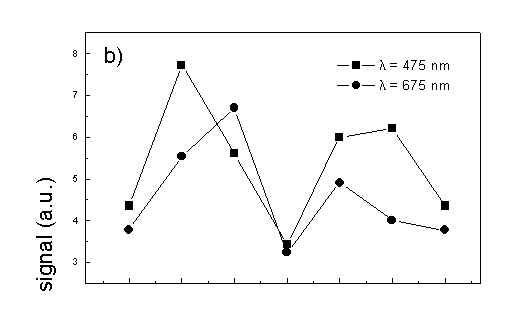 Figure 3 show the polarized PAS spectra of two types of whole cells samples in unstretched film (Fig. 3a with oligomers and Fig. 3b desaggregated whole cells). Figure 3c presents whole cells without oligomers sample in stretched film, Fig. 3d the cell fragments also in stretched film. Not all measured spectra are shown in these figures because the presentation of all spectra for six different polarizations makes figures to crowded. It is possible to see the orientations of TMs in oligomers and in desaggregated BChl c. Also orientation of carotenoids is different from that of BChl c. The thermal deactivation in a region of Soret band is low, lower than in a region of carotenoids absorption. Similar effect was observed for cyanobacteria . Carotenoids, when are not engaged in excitation energy transfer to other pigment have always efficient thermal deactivation because their yield of fluorescence is low. Fig. 3. Polarized photoacoustic spectra (a,b - in unstretched film, c,d - in stretched film): (a) whole cells with oligomers; (b) whole cells without oligomers; (c) whole cells without oligomers; (d) cell fragments. Angles between electric vector of light and axis in film plane are given in Figs. Figure 4 shows the dependence of PAS amplitude on the angle q between film axis and the direction of electric vector of light. In a case of unstretched film direction in a film plane is arbitrary, but direction of electric vector of light is changed on 30 deg from 0 deg till 180 deg, similarly as in a case of stretched samples. As it follows from Fig. 4a (whole cells with oligomers) and Fig. 4b (whole cells with desaggregated oligomers) main maximum of carotenoids in both cases occurs at 30 deg. In a sample without oligomers a second smaller maximum of carotenoids is observed in 120-150 deg region. This maximum is absent in a sample with oligomers. 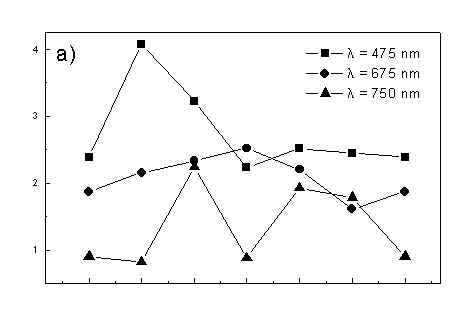 The curves for a region of monomer and small aggregates (675 nm) is quite different for two samples. In a sample with oligomer it has only one maximum at 90 deg, whereas a desoligomerized sample exhibit at 90 deg deep minimum, and two maxima at 60 deg and 120 deg. It shows that oligomers can be desaggregated as it was previously supposed [4,5] on small aggregates exhibiting quite different orientation than monomeric pigment. Only in instretched film with whole bacteria (Fig. 4a) the maximum for 750 nm at 120 deg is seen. The stretching perturbs the orientation and aggregates, as it follows from Fig. 1b, therefore the oligomer maximum is not seen. And as it follows from the comparison of Fig. 4a and Fig. 4b perturbing previous orientation of monomeric pigment located also in chlorosomes. In a sample with oligomers the angle between orientation of carotenoids and monomers of BChl c is about 60 deg, whereas in sample without oligomers this angle is about 30 deg. Similar angle is observed in whole cells in stretched film (Fig. 4c) and in cell fragments stretched film (Fig. 4d). Both samples in stretched film are without oligomers. From Fig. 4 we can draw information about average angles of orientation of the pools of chromophores responsible for efficient thermal deactivation of energy. Comparing Fig. 3a (PAS spectra) with Fig. 1a (absorption) we can see that the efficiency of thermal deactivation is much lower for oligomer than for small aggregates and monomers region. It is reasonable because desaggregated pigment is excluded from the chain of excitation energy donors and acceptor. From oligomers the excitation energy transfer to the direction of reaction center is competing successfully with thermal deactivation and emission of fluorescence. It is not possible to compare the observed angles with the known [1,2] structure of chlorosome, because results concern only the groups of chromophores efficiently converting the excitation energy into heat. Fig. 4. The amplitudes of photoacoustic signal as a function of angle between film axis and electric vector of light (q ) for some wavelengths of light (given in figure: 475 nm - absorption of carotenoids; 675 nm - monomers and small aggregates of BChl c; 750 nm - oligomers of BChl c); (a) – (d) have the same description as in Fig. 3. The paper was realized in a frame of Japanese-Polish grant nr RJ-3 and supported for (AD and AP) by Poznań University of Technology (grant DS-1999). J.M.Olson, Chlorophyll organization in green photosynthetic bacteria, Biochim . Biophys. Acta 595, 33-51 (1980). K.Griebenov and A.R.Holtzwarth, Pigment organization and energy transfer in green bacteria. Isolation of native chlorosomes free of bound bacteriochlorophyll a from Chloroflectus aurantiacus by gel electrophoretic filtration, Biochim. Biophys. Acta 973, 235-240 (1989). K.Matsuura and J.M.Olson, Reversible conversion of aggregated bacteriochlorophyll c to the monomeric form by 1-hexanol in chlorosomes from Chlorobium and Chloroflexus, Biochim. Biophys. Acta 1019, 233-238 (1990). T.Martyński, D.Frąckowiak, J.Miyake, A.Dudkowiak and A.Piechowiak, The orientation of bacteriochlorophyll c in green bacteria cells and cell fragments, J.Photochem. Photobiol. B: Biology 42, 57-66 (1998). D.Frąckowiak, A.Dudkowiak, A.Ptak, H.Malak, I.Gryczyński and B.Zelent, Fluorescence lifetimes of oriented green bacteria cells, cell fragments and oriented bacteriochlorophyll c molecules, J.Photochem. Photobiol. B: Biology 44, 231-239 (1998). 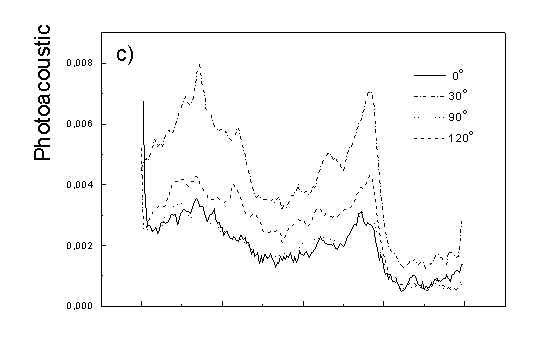 A.Dudkowiak, C.Francke, J.Amesz, A.Planner and D.Frąckowiak, Spectral properties of bacteriochlorophyll c in nematic liquid crystal, II. Aggregated forms of dye, Spectrochim. Acta (A) 52, 1661-1669 (1996). A.Planner, M.Hara, J.Miyake, K.Klaczyńska and D.Frąckowiak, Polarized photoacoustic spectra of various photosynthetic cyanobacteria embedded in polymer film, J.Photochem. Photobiol. B: Biology (submitted). 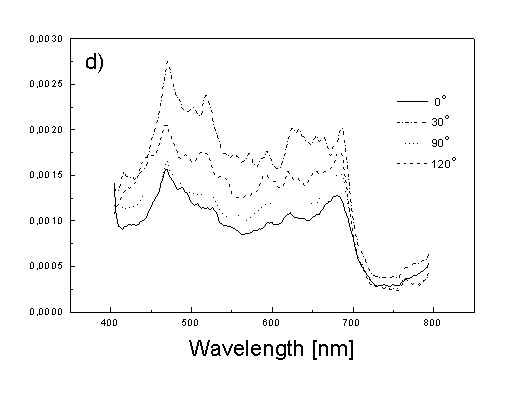 D.Frąckowiak and A.Dudkowiak, Spectroscopic investigations of the pigment orientation in isolated photosynthetic systems, Photosynthetica 26, 503-515 (1992). D.Frąckowiak, S.Hotchandani, B.Szych and R.M.Leblanc, Polarized photoacoustic spectroscopy of oriented systems, Acta Phys. Polon. A69, 121-133 (1986).